From logo redesigns to product extension, this e-book explores six brands that have made a major OOPS, six other brands that get a ‘WHOOP WHOOP’ for their work well done, and how all of this can be applied to the arts. This guide was developed by the US nonprofit National Arts Marketing Project - a programme of Americans for the Arts, and is full of innovative case studies and fresh, bold ideas to boost audience development and revenue. Inviting naked cyclists into a museum to find new audiences? Bringing art to the local laundromat to promote community dialogues? Bringing random strangers together to interpret permanent collection pieces? 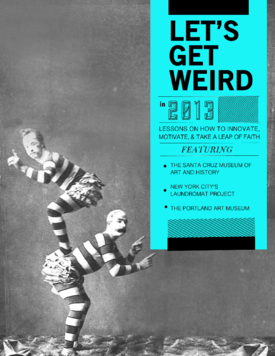 These concepts may seem bold, but for the Santa Cruz Museum of Art and History, the Laundromat Project, and the Portland Art Museum, weird strategies like these have fostered an organisational culture that draws in the community and gives patrons an experience they won’t soon forget. Americans for the Arts is the US nation’s leading nonprofit organisation for advancing the arts in America. With more than 50 years of service, they are dedicated to representing and serving local communities and creating opportunities for every American to participate in and appreciate all forms of the arts. The National Arts Marketing Project is a program of Americans for the Arts.